Jeep Wrangler (TJ) (1997-2006); Rear Turn Signal, Rear Parking Light, Brake Light. Jeep Wrangler (TJ) (1997); Rear Turn Signal, Rear Parking Light, Brake Light. 1157 Whte LED Plasma Bulb Kit; Includes 2 Lights; Installs In Place of OEM Bulbs. 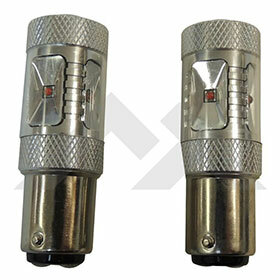 Each lamp includes 6 Cree LED's that produce 1200 Lumens; 360 Degree Light Output. Each Lamp is rated at 7.2 Watts / .6 Amps Draw at 12 Volts. 50,000 Hour LED Bulb Life; IP68 IP65 Rated For Shock Protection.